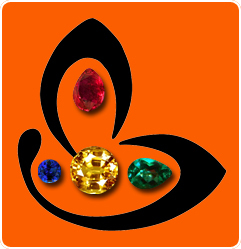 You are here: Home / Customized Rings and Pendants / Glorious and Imposing Natural Madagascar Iolite Ring – Just what a Design Detail can do for Your Gem! 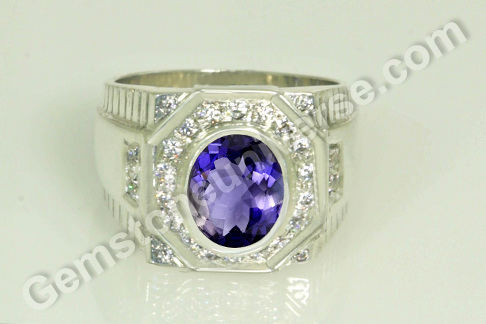 Glorious and Imposing Natural Madagascar Iolite Ring – Just what a Design Detail can do for Your Gem! Comments Who says your gemstone talisman needs to be austere, boring, or staid? A little eye for detail and a tasteful design is all it takes a regular gem to become the star! Take a cue from this- featured today is a natural and treatment free iolite of 2.71 carats set in sterling silver as a Saturn talisman ring! The oval shaped natural iolite from Madagascar has a lovely royal bluish violet color and fantastic clarity. The beauty of the gem is brought out by the halo of diamond simulants surrounding the iolite. Natural iolite/ neeli is the substitute gem of natural blue sapphire or neelam and is the gem of Lord Saturn / Shani. It is in fact the gem of Saturn’s consort and therefore also goes by the name ‘Shanipriya‘. Iolite is a pleochroic gem – one that displays different colors when viewed from different angles. Pleochroism is caused by differing absorption of light rays in doubly refractive crystals. Iolite is also referred to as ‘water sapphire’. Iolite is known to display colors ranging from pale blue to violet to grey to yellow at different angles!